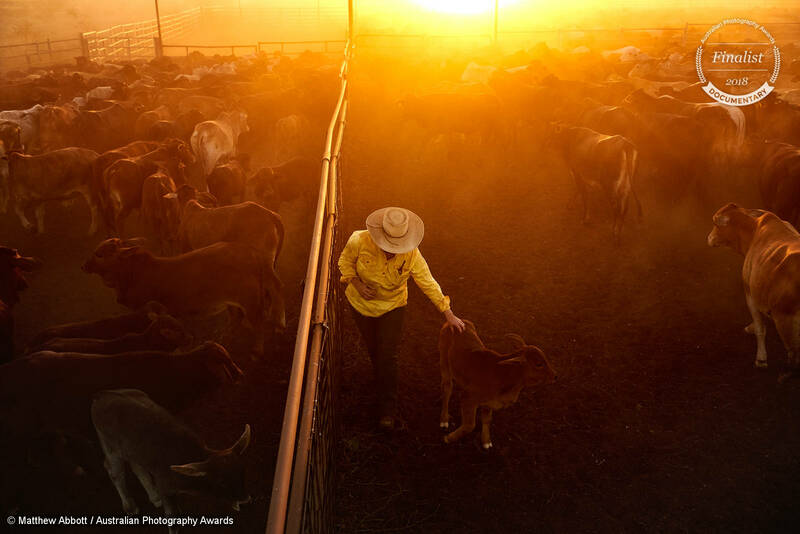 Thanks for joining me, APA competition judge Matt Palmer, as I look at the winning Australian Photography Awards Documentary photograph of 2018 as well as looking at what made the rest of the top ten so successful. The documentary category in 2018 grew in leaps and bounds and we saw an increase in hard-hitting photojournalism as well as great work within travel, birth and sporting documentary. Thank you to all of you who put your entries in, you made the judging incredibly hard but immensely satisfying with the quality of your photographs. PLEASE NOTE: Some of the photographs below include medical scenes. Are you excited? I am… so let’s jump in! 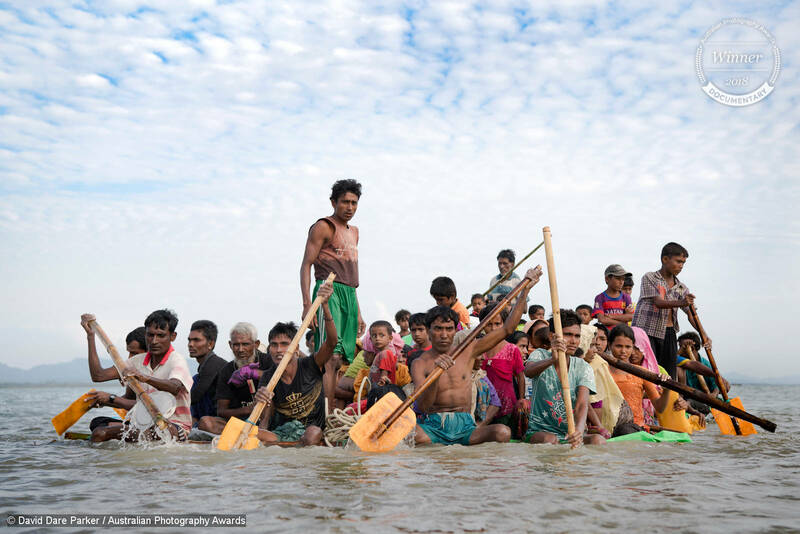 “After 16 – 20 days waiting on the Myanmar border, Rohingya refugees cross the Naf River into Bangladesh using eight makeshift rafts made out of bamboo and plastic palm oil containers. Often described as the “world’s most persecuted minority”, the Rohingya are a Muslim ethnic group from the Rakhine State in Myanmar. In October 2016, a military crackdown in the wake of a deadly attack on an army post sent hundreds of thousands of Rohingya fleeing to neighboring Bangladesh. We felt that David’s photograph captured desolation, uncertainty, and yet a sense of optimism as the Rohingya refugees risk their lives, perched so precariously close to the water with only the slimmest barrier between life and death. Exodus is a photograph that you can sit with as a viewer for some time, noticing new expressions and details, all of which adding weight and story to the photo. Technically the photograph is presented simply, it would be easy to overlook the expertise with which it was shot. The exposure is perfect, especially with the challenges of working with dark skin and ensuring there are details in the shadow areas. With the complexity of faces in the center, the foreground and background are left deliberately subtle, just enough to contribute to the story. This prevents competing elements and allows the viewer to focus on learning more about the refugees. David also gets fairly close to the waterline so that he can photograph the refugees on their level, making the scene more engaging. Everyone involved in the Australian Photography Awards is thrilled to have David Dare Parker’s ‘Exodus’ represent the Documentary category as its winner in 2018. This untitled photograph by Melissa Anderson exudes atmosphere and mood. 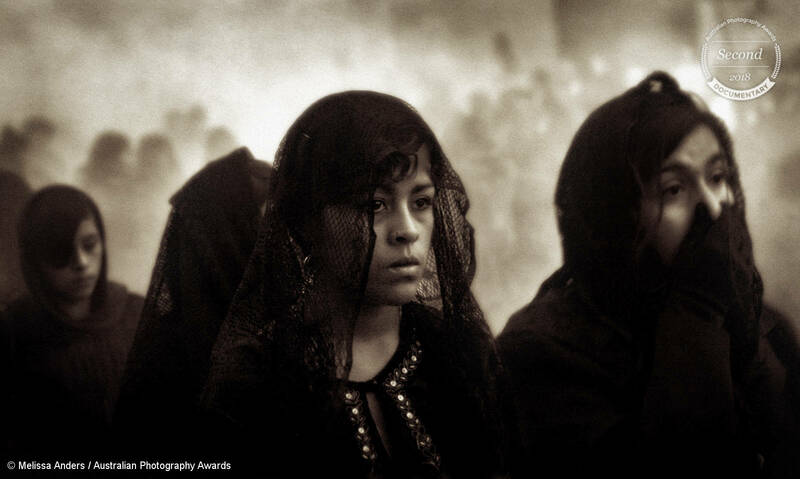 The viewer is left to interpret the scene, I would speculate it could be a mass mourning given the dark clothing worn and solemn faces. The woman in the center is captivating and beautifully lit, and the women in front and behind support the narrative without competing. The background in this photograph has a special feeling about it, the grainy unfocused masses really add a huge amount of atmosphere and depth, with the figures to the left being larger, trailing into smaller figures on the right. It gives you a feeling of the size of this scene without adding complication. Birth photography and cesarian section captured stunningly and theatrically. We loved the baby reaching with arms outstretched, and clear unobstructed view of its face. 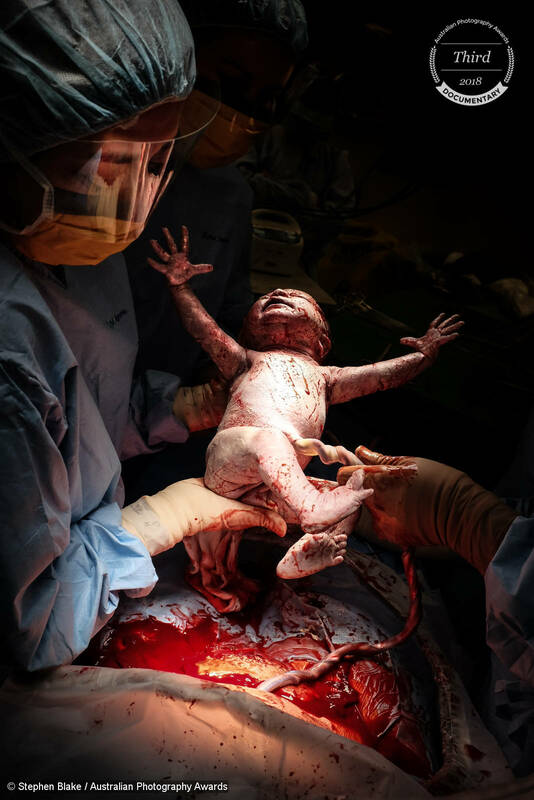 The position in the frame provides a nice clean dark background that contrasts surgical light against darkness giving this birth photograph a sense of theatre and drama. The medical team also provide a nice frame for the newborn and their cool blue scrubs are a needed counterbalance against the crimson blood. 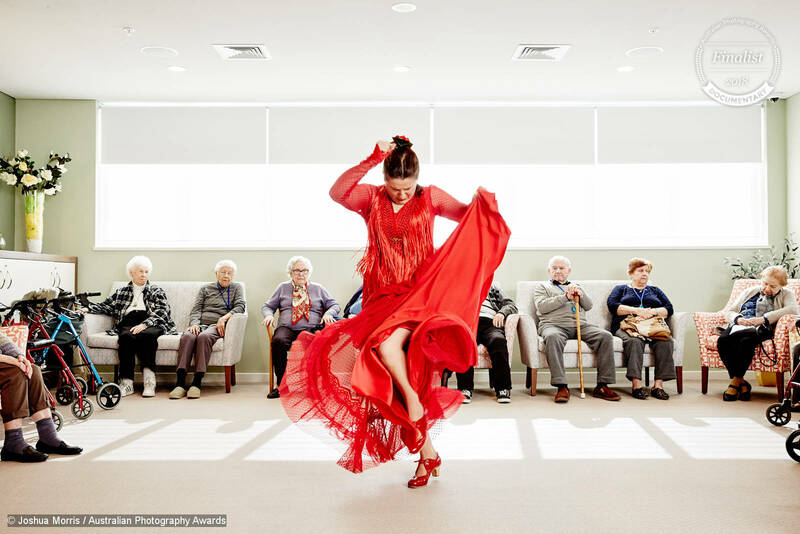 Pepa Molina is a flamenco dancer and instructor who is photographed here dancing for residents at a Spanish speaking nursing home in Rooty Hill in Sydney’s West. Pepa and photographer Joshua Morris bring what could have been a fairly banal nursing home scene to life. Pepa’s energy and capturing her pose at this moment, with the movement of her dress, provide the perfect juxtaposition against the static audience who are in varying degrees of engagement. The photograph is composed perfectly. Vertical and horizontal lines are straight, the left-most legs and right-most walker help frame the audience and dancer, and there are small touches such as the bouquet on the left that help provide narrative and balance in the frame. Joshua has also done exceptionally well to shoot into the window light, allowing it to blow out to a clean white that could easily offer distraction but does not. The exposure across the frame on each subject is perfect. This is a beautifully considered and subtle portrayal of Jane, who is suffering PTSD after being violently mauled by a breakaway bull in a yard. This photograph of Jane entering the yards with the attack fresh in memory is beautiful, tender, innocent and optimistic. The interaction between Jane and calf communicates the beginning of a healing process for her. The photographer’s perspective in the yard helps place this moment within a frame that sets the scene and finds a space for Jane and the small calf to stand out in isolation. The position of Jane by the fence allows this strong element in the photograph to lead you to Jane, otherwise, if the two elements were separated in the frame, they may have competed instead. 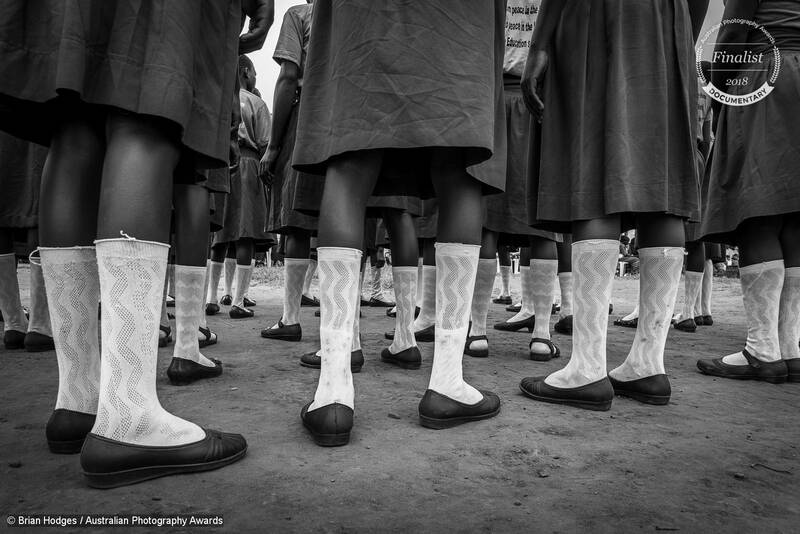 This photograph of female students in Gulu, Uganda uses an unsual perspective to tell its story. The beautifully handled skin tones, patterned and repeating socks and raw soil help to place this photograph in an African context. The small bag or t-shirt with the words ‘peace’ and ‘education’ support a story of elevating women in these communities by providing education and opportunity. On the left, there is a peek through the students showing a side profile of a students face which helps further humanise a photograph that contains little engagement with the viewer, who is left viewing the scene through a sea of socks. There is a sense of nostalgia invoked with this photograph from Marta. The children are twisted and distorted as they play football on a trampoline in falling rain. The small leaves and dirt washing down their bodies from water droplets is a nice touch that adds texture to the skin, and the rain is clearly visible in the photo offering an interesting textural and storytelling element as well as creating atmosphere. Given the chaos Marta has done remarkably well composing the photo, providing each boy with space in the frame, and each expression and pose supports the overall capture. 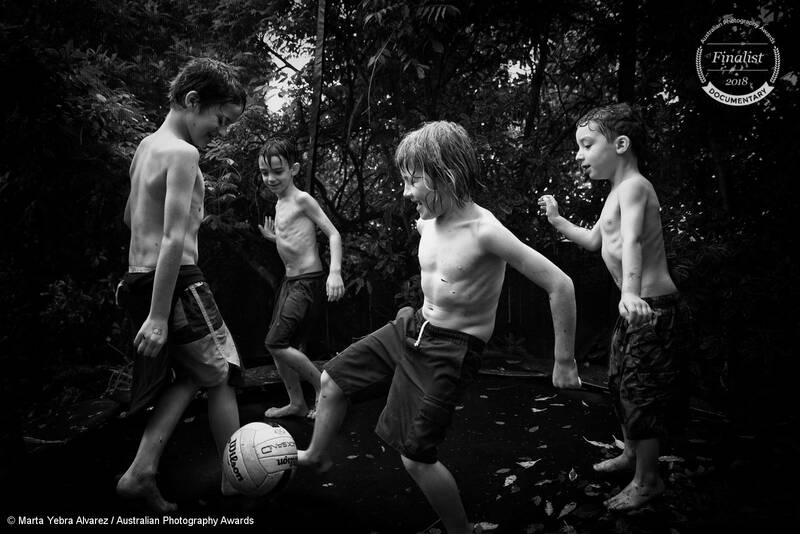 Proof that sometimes great documentary photography can be in the backyard! Larry’s photograph of a papermaker preparing pulp and starch mulch exudes atmosphere. The paper will be used in monasteries for manuscripts and written prayers. 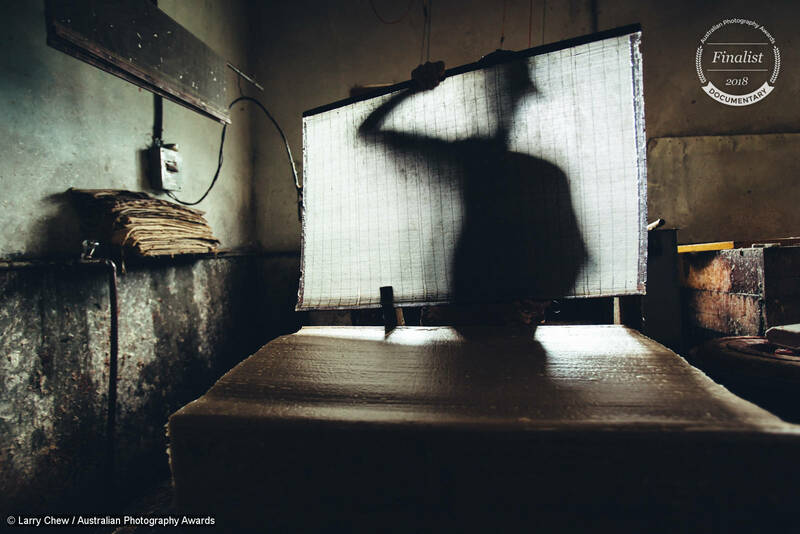 The positioning of the papermaker behind the paper, creating a diffused silhouette, adds to the mystery and a sense of reverence that supports the paper’s final use. This intentional decision and just the peek of working hands above and below paper give a unique take on photographing craftspeople in foreign countries. This birthing capture has an immediate impact as a babies head emerges amongst celebratory streamers of fluid. The mother’s grandmother becomes midwife on the spot and begins delivering the baby with attentiveness as the fluids trickle down her arm and over her wedding band. The baby is yet to even take its first breath! The colouration before first breath apparent from one frame to the next as the baby takes on a light tone of amethyst in the skin. The scene is shot very cleanly, suggesting that bounced flash may have been used expertly to lighten the room and help capture crisp details. This tender documentary photograph by Victoria has a warmness and gentleness to it. Even though the dad’s face isn’t visible, the pose and profile offer a sense of connection with the son. 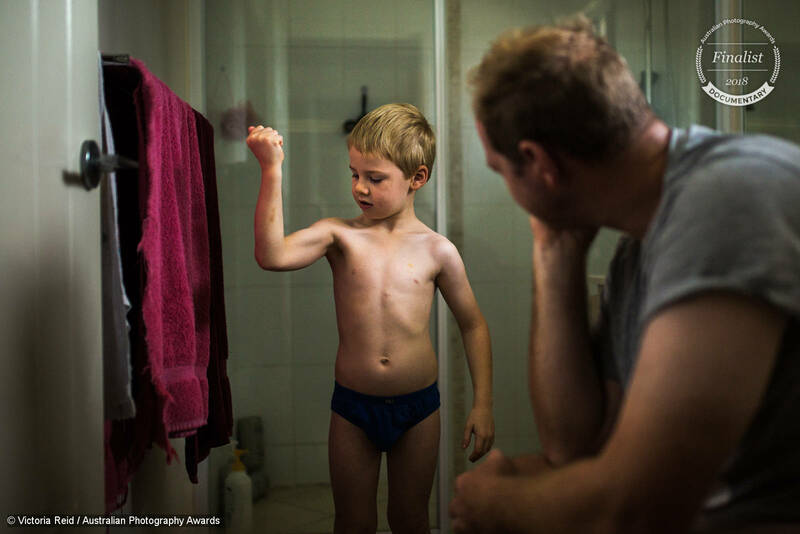 The photograph explores the influence fathers have on their sons and their sense of identity. The lighting on the son is beautiful, especially in a challenging domestic setting, and leads the viewer’s eye exactly where it’s intended to be within the frame. The son has some small bruises and scrapes that give some insight into the boy’s sense of play and yet his vulnerability. Victoria has done well to be anonymous in the scene as the father and son are so completely raw and comfortable. Thank you for joining me as I discuss our Australian Photography Awards Documentary Top 10. I think you’ll agree that there are some incredible photographs both inside and outside the top 10 and your entries and support of the competition this year has been amazing.